Last time I talked about what kind of soil to plant strawberries in and which types to choose. Part 2 covers how and when to plant strawberries and what to do with them once they’re in the ground—other than harvesting and piggin’ out on them, of course. The most economical way to purchase strawberry plants is to get bundles of bare-root plants. They are more fragile than if you get them in little 3-inch starter pots, but it will save you money. Just remember to time your purchase to arrive within a day or two of planting and you should be fine. If you don’t plant them right away, make sure to keep the rootballs moist; you can wrap them in wet newspaper and keep the paper moist until ready to plant. Most experts say to wait until an overcast day and to plant in the mid-morning. In northern climates—zone 5 and below—strawberries should be planted from late March to April. In zones 6 and up, strawberries should be planted in the fall for a spring harvest. If you’re working with bare-root plants, put them in a bucket of water up to just below the crowns and let them soak for an hour. In the meantime, you can start digging your holes, which should be slightly larger than the rootball. It’s important that your baby strawberry plants are set in at the right depth: too low and they may get crown rot; too high and the roots may dry out and the plants won’t thrive. See Figure 1 for an illustration of the correct planting depth. Which Planting Configuration Should You Use? There are a few different ways to plant strawberries: matted rows, spaced rows and hills. Here are several things to consider when deciding which system is best for you, your plants and your garden. Matted rows. The matted row planting system is the most popular method for growing June-bearing varieties. The plants are set 18–30 inches apart in rows 3–4 feet apart. The runner plants are allowed to root freely to form a matted row about two feet wide. See Figure 2 for illustration. Spaced rows. This system limits the number of daughter plants (i.e., runners) that grow from a mother plant. The mother plants are set 18–30 inches apart in rows 3–4 feet apart. The daughter plants are spaced to root no closer than 4 inches apart. All other runners are removed. This is probably the most labor intensive planting method but can result in higher yields, larger berries and fewer disease problems. Hills. The hill system is considered the best method for growing everbearing and day-neutral cultivars and when drainage is a problem. Unlike squash hills, strawberry hills should be about 6–8 inches high and 2 feet wide. Two or three plants are spaced 10–12 inches apart in each hill and hills can be staggered about 12 inches apart. All runners are removed from the everbearers and day-neutrals so that only the original mother plant is left to grow. Removing the runners enables the mother plant to develop numerous crowns and more flower stalks. How I did it. I chose to plant June-bearing strawberries; therefore, I used a modified matted row system. Because space was limited, my rows were only about 3 feet apart and plants were only about 18 inches apart within the rows. I had so many plants left over I started a second patch along the east border of my garden, next to my neighbor’s hostas. Even so, I STILL had leftover plants, which I gave away to another one of my gardening neighbors. Lesson learned: Be realistic about space constraints; no matter how much I wanted them to, I was not going to fit 20 strawberry plants in a 4 x 4 foot patch. So we’ve located a good spot with plenty of sun and adequate drainage, prepared the patch by weeding and amending the soil with lots of rich organic matter. We’ve decided which kinds of strawberries to plant, settled on the best system—matted row, spaced row or hills—dug the holes and put those babies in the ground, firming the soil around each plant and making sure the soil was just below the crown and completely covering the roots. After watering thoroughly, we get to take a breather and enjoy our handiwork. But not for long; there’s more work to be done. Mulch. Unlike garden favorites such as tomatoes and peppers, strawberries like cool, moist soil. Therefore, they can be mulched almost from day one. A thick layer of straw between rows and plants will keep weeds down and the soil cool. Pine needles also make a great mulch additive. Remove blossoms. Pinch off any blossoms that appear the first year that you plant June-bearers. This will encourage the plants to grow vigorously and produce more runners. The payoff comes the following season when your patch will be bursting with big, juicy strawberries! Everbearing varieties will produce two or three harvests throughout the growing season and will produce a full crop the first season. They do not make many runners. Day-neutral strawberries will produce throughout the growing season and also offer few runners. Experts say that buds should be removed the first 4–6 weeks after planting to help establish healthy plant and root growth. Water. It’s important to keep your patch watered—especially when producing. Strawberries have a shallow root system and require a good inch of water per week. Soaker hoses under the mulch are ideal. I used a wand at the end of a hose and they did fine—as long as the leaves have enough time to dry before dark. Fertilize and mulch again. Remove runners on the everbearers and day-neutrals and enjoy the harvest the first season. You can sidedress between harvests with well-decomposed compost. Simply move the mulch out of the way, pull up the stray weeds that are trying to gain a foothold, add a couple of inches of compost, being careful that it does not come in direct contact with the plants, and replace the mulch. It doesn’t hurt to sidedress the June-bearers in the early fall and mulch everything heavily (4–6 inches) with straw before the first frost. How I did it. Exactly as described above: I mulched, pinched blossoms, sidedressed and mulched again. My own compost pile wasn’t ready that first season so I used organic mushroom compost in a bag. I didn’t have to do much weeding because I tend to lay down the straw mulch pretty thick. By the third year after planting I had a bumper crop of organically grown strawberries as big and as beautiful as you could find in any grocery store—but much healthier and better-tasting. With my next garden, I am going to include day-neutrals and have two strawberry patches. After researching and preparing this article I’m convinced that having berries the first season is a nice trade-off for smaller fruit. This section is from the University of Illinois Extension site; I have never mowed my strawberry patch, but I’ve heard it’s a good practice; unless, of course, you planted your strawberries in hills, in which case a weed whacker might serve the same purpose. In order to ensure good fruit production, June-bearing strawberries grown in the matted row system should be renovated every year right after harvest. A strawberry patch will continue to be productive for 3–5 years as long as the patch is maintained. The first step in the renovation process is to mow the old foliage with a mower, cutting off the leaves about one inch above the crowns. Rake the leaves and if disease-free, compost or incorporate into the soil. Narrow the rows to 6–12 inches wide by spading, hoeing or rototilling. Remove all weeds. Thin the plants in the narrowed row to 4–6 inches between plants. Water with 1 inch of water per week to promote growth and to make new runners for next year’s crop (http://urbanext.illinois.edu/strawberries/growing.html). Home Vegetable Gardening by F.F. Rockwell (original copyright 1911) is a rare gem that looks at how people in the U.S. gardened – and lived – about 100 years ago. It is priceless Americana that shows how far we have come socially and environmentally (the poisons that were commonly used back then make me shudder – most of them are banned for use as pesticides and herbicides in the U.S. today, thank God) at the same time how some things remain the same. (The author writes in the preface about how having a backyard garden is a great antidote to “high prices” – at a time when a loaf of bread cost about a nickel. The following excerpt about choosing just the right spot for your new garden is as relevant today – except for the part about making sure it is a suitable location for a horse-drawn plow to be able to turn around – as when it was written in 1911. Home Vegetable Gardening is a public domain book, meaning that nobody owns a U.S. copyright. I thought it might be fun to post occasional excerpts from the book here, starting with chapter 1. I’d love to know what you think! In deciding upon the site for the home vegetable garden it is well to dispose once and for all of the old idea that the garden “patch” must be an ugly spot in the home surroundings. If thoughtfully planned, carefully planted and thoroughly cared for, it may be made a beautiful and harmonious feature of the general scheme, lending a touch of comfortable homeliness that no shrubs, borders, or beds can ever produce. With this fact in mind we will not feel restricted to any part of the premises merely because it is out of sight behind the barn or garage. In the average moderate-sized place there will not be much choice as to land. It will be necessary to take what is to be had and then do the very best that can be done with it. But there will probably be a good deal of choice as to, first, exposure, and second, convenience. Other things being equal, select a spot near at hand, easy of access. It may seem that a difference of only a few hundred yards will mean nothing, but if one is depending largely upon spare moments for working in and for watching the garden—and in the growing of many vegetables the latter is almost as important as the former—this matter of convenient access will be of much greater importance than is likely to be at first recognized. Not until you have had to make a dozen time-wasting trips for forgotten seeds or tools, or gotten your feet soaking wet by going out through the dew-drenched grass, will you realize fully what this may mean. But the thing of first importance to consider in picking out the spot that is to yield you happiness and delicious vegetables all summer, or even for many years, is the exposure. Pick out the “earliest” spot you can find—a plot sloping a little to the south or east, that seems to catch sunshine early and hold it late, and that seems to be out of the direct path of the chilling north and northeast winds. If a building, or even an old fence, protects it from this direction, your garden will be helped along wonderfully, for an early start is a great big factor toward success. If it is not already protected, a board fence, or a hedge of some low-growing shrubs or young evergreens, will add very greatly to its usefulness. The importance of having such a protection or shelter is altogether underestimated by the amateur. The chances are that you will not find a spot of ideal garden soil ready for use anywhere upon your place. But all except the very worst of soils can be brought up to a very high degree of productiveness—especially such small areas as home vegetable gardens require. Large tracts of soil that are almost pure sand, and others so heavy and mucky that for centuries they lay uncultivated, have frequently been brought, in the course of only a few years, to where they yield annually tremendous crops on a commercial basis. So do not be discouraged about your soil. Proper treatment of it is much more important, and a gardenpatch of average run-down—or “never-brought-up” soil—will produce much more for the energetic and careful gardener than the richest spot will grow under average methods of cultivation. The ideal garden soil is a “rich, sandy loam.” And the fact cannot be overemphasized that such soils usually are made, not found. Let us analyze that description a bit, for right here we come to the first of the four all-important factors of gardening—food. The others are cultivation, moisture and temperature. “Rich” in the gardener’s vocabulary means full of plant food; more than that—and this is a point of vital importance—it means full of plant food ready to be used at once, all prepared and spread out on the garden table, or rather in it, where growing things can at once make use of it; or what we term, in one word, “available” plant food. Practically no soils in long- inhabited communities remain naturally rich enough to produce big crops. They are made rich, or kept rich, in two ways; first, by cultivation, which helps to change the raw plant food stored in the soil into available forms; and second, by manuring or adding plant food to the soil from outside sources. This, then, will give you an idea of a good garden soil. Perhaps in yours there will be too much sand, or too much clay. That will be a disadvantage, but one which energy and perseverance will soon overcome to a great extent—by what methods may be learned in Chapter VI. There is, however, one other thing you must look out for in selecting your garden site, and that is drainage. Dig down eight or twelve inches after you have picked out a favorable spot, and examine the sub-soil. This is the second strata, usually of different texture and color from the rich surface soil, and harder than it. If you find a sandy or gravelly bed, no matter how yellow and poor it looks, you have chosen the right spot. But if it be a stiff, heavy clay, especially a blue clay, you will have either to drain it or be content with a very late garden—that is, unless you are at the top of a knoll or on a slope. 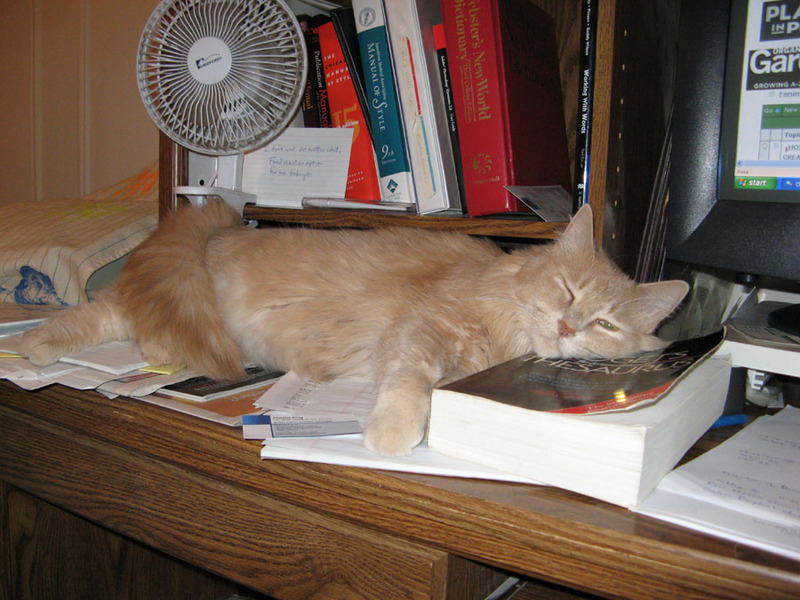 Chapter VI contains further suggestions in regard to this problem. There was a further reason for, mentioning that strip of onion ground. It is a very practical illustration of what last year’s handling of the soil means to this year’s garden. If you can pick out a spot, even if it is not the most desirable in other ways, that has been well enriched or cultivated for a year or two previous, take that for this year’s garden. And in the meantime have the spot on which you intend to make your permanent vegetable garden thoroughly “fitted,” and grow there this year a crop of potatoes or sweet corn, as suggested in Chapter VIII. Then next year you will have conditions just right to give your vegetables a great start. Fill all of these requirements that you can, and then by taking full advantage of the advantages you have, you can discount the disadvantages. After all it is careful, persistent work, more than natural advantages, that will tell the story; and a good garden does not grow—it is made. Whether you choose early-, mid- or late-season June-bearers, the smaller but more frequent everbearers, or the young upstart day-neutrals, a freshly picked, perfectly ripened homegrown strawberry does not exist in the same galaxy as its cardboard cutout, dry-as-sawdust store-bought brethren, let alone on the same planet. Here are some tips on how you can grow the biggest, most juicy and flavorful strawberries ever—without using harmful pesticides or other chemicals! When I read a few years ago that conventionally grown strawberries retained more toxic pesticide residues than just about any other fruit, I knew I had to start growing my own—because I loooooove strawberries. With the cost of organic strawberries—in season—hovering around $3/pint (I can’t even imagine what they cost now), I was eating a lot of pesticide-residue-riddled berries. Although strawberries are easy to grow, these highly versatile nectars of the gardening gods require an abundance of the basic elements of photosynthetic life: lots of sun (at least 6 hours of direct sun a day), slightly acidic soil (between 5.5 and 6.5 pH, according to eHow.com) that is rich in organic matter and allows for good drainage, and about an inch of water per week—especially when the fruit is developing. I’ve also read that, when choosing where to put the patch, to be careful to avoid planting strawberries where tomatoes, potatoes, peppers, eggplants or raspberries have been grown for the past several years. These plants can harbor verticillium wilt, which is particularly hazardous to strawberries. Every university extension site I visited, with the exception of Ohio State’s, listed chemical solutions for treating this pervasive fungus. Based on what I’ve read, the best organic solution is prevention. Good drainage is important because strawberries have shallow root systems. They need plenty of water for big, juicy berries but cannot abide sitting in standing water and will rot. Some experts recommend planting strawberries in hills or in raised beds loaded with lots of well-composted organic materials. How I did it. Other than the advice not to plant strawberries where tomatoes had been, I didn’t really know any of this stuff when I first planted my strawberries. I picked a section of a dormant flower bed for my primary patch. The fall before planting I pulled up all the weeds and turned the soil, which had been sitting fallow for at least a year before I secured my patch at the community garden. The nun who had tended the garden of which my patch was only about a third was very ill and couldn’t keep up with her garden. She died the winter before I began leaving voicemails for Sister Rita, pestering her for a veggie patch of my own. My first fall at the patch I dumped a couple of 40 lb bags of organic mushroom compost on the patch (my own newly established compost pile wasn’t “ripe” yet) and worked it lightly into the soil. And that was pretty much it. Poor quality photo of my strawberry patch a couple of months after planting (July 2006). When it came time to actually pick out what type of strawberries I wanted to grow, I was faced with an overwhelming array of choices. Because I had spent a couple of summers and many, many weekends working for my dad on his organic farm in southwestern Michigan, I knew there were everbearing strawberries, which, under the right conditions, would produce throughout the growing season, and June-bearing strawberries, which, like the name implies, bear fruit just once per year in late spring to early summer. What I didn’t know was that within each broad category were a number of different choices: For instance, June-bearers have early-, mid- and late-season varieties. I suppose an ambitious gardener—or a strawberry addict—could cultivate all three to keep fresh strawberries on the table for a couple of months rather than the typical 3-week production cycle. Everbearers produce smaller berries a couple of times a year (spring and fall) and don’t shoot off as many runners (picture spider plant offshoots that, instead of dangling from a hanging basket, spread along the ground, and then start establishing new roots once far enough away from the mother plant) as June-bearers. Then there’s a newer cultivar I knew nothing about called the day-neutral. According to the Purdue University Extension office’s Yard and Garden News Web page, day-neutrals are a true everbearer and can produce fruit throughout the growing season, as long as it doesn’t get too hot. May 2007 - First full season and both patches (main patch is at the top right of photo) are robust and setting fruit! How I did it. Although the space allotted for my strawberry patch was pretty small (about 4’ x 4’) I decided to go with the June-bearers. Aesthetics are important to me; I wanted to grow big, juicy, luscious strawberries, not the puny (to me) everbearers my dad grew on his farm. I figured, so what if I could enjoy them fresh for only a few weeks? I could (and did) enjoy the frozen berries I put up for months! By the third season I was very pleased with my choice. My strawberries, picked ripe, not green and spiny like the flavorless store-bought berries, rivaled what you could buy at Jewel or Safeway in size and had irresistibly incomparable flavor. My mouth is watering just thinking about them. I can’t wait for spring! On the other hand, although day-neutrals can produce throughout the growing season, they practically have to be treated as annuals, which means you have to replant them every year. Next week I will finish my ode to strawberries with tips on their planting and care that will assure you of the most delicious strawberries you have ever tasted. Tip of the Week: A Slugfest Smackdown! *WARNING* Gross pictures of slimy slugs are included. Not recommended for the squeamish. Just so you know, I am not a violent person. I’m all about live and let live–except when it comes to slugs. Before I jump into my sure-fire organic controls for slugs, a quick qualifier: My gardening experience is limited mostly to the Midwest zones 4-5. Although I woke up one morning to find a banana slug the size of, well, a frickin’ banana! sliming its way up the side of my tent while camping in Northern California, my gardening experience with slugs is limited to the smaller, snot-colored varieties–like the ones that destroyed three entire plantings of marigolds in my garden patch one spring. Slugs thrive in cool, moist environments and love feasting on stuff like lettuce, ripe strawberries and marigolds. I had actually never had a problem with slugs until that fateful spring two seasons ago. I planted marigolds and mulched my tomatoes two weeks earlier than I normally do (mid-May, instead of waiting until after Memorial Day weekend). And I wound up paying the price in marigolds. But I learned two valuable lessons that year, as well: (1) Wait until the soil has warmed up sufficiently before mulching and (2) don’t plant the 8-pack flats of marigolds before Memorial Day; they don’t stand a chance against those voraciously slimy eaters. Beer traps. I used wide-mouthed jar lids to set the traps and was careful to make sure the lips were at least 1/3 inch above ground so that once the slimy creatures joined the beer fest, they couldn’t get back out. I don’t drink, so I didn’t want to waste money on some fancy beer; if I remember correctly a 40 oz bottle of Old Style was the cheapest I could find without springing for an entire 6-pack. I’ve read you can also mix water, sugar and yeast for the same slug-slurping effect. Haven’t tried it, myself. The beer was good bait. The traps caught quite a few slugs–but did not prevent them from continuing to eat my poor marigolds! Copper. I read in one of my organic gardening books that placing bands of copper around the base of young plants would act as a deterrent for slugs. So I went to Home Depot and found a small roll of copper something or other that was about a ½ inch wide. For the life of me I cannot remember what it’s supposed to be used for; I think I found it in the plumbing section. I diligently placed little copper collars around the young broccoli and cabbage plants–and around my second planting of marigolds. Broccoli and cabbage did fine; the marigolds continued to get devoured. At my wit’s end–and on my third planting of marigolds, which I plant every year as a companion to tomatoes because they repel tomato hornworms (those hard-to-spot giant green caterpillars that feast on the underside of tomato plant leaves) and aphids–on the advice of an organic gardening friend, I bought a bottle of Slug Magic pellets. Ya’ just sprinkle them around the base of the plants, the slugs ingest them, and over the course of 3-6 days puff up and die. Works like a charm. The pellets are considered organic because they are a biological control, do not harm other beneficial bugs or animals, and are biodegradable. I still swear by waiting until the soil has warmed up before mulching and not planting too early. When I do that, I have no problem with slugs. But if you must, iron phosphate, the slug-destroying ingredient in Slug Magic, is a sure-fire winner; and it truly does work like magic! Amazon carries it if you want to order online. Otherwise, you can find it at most gardening centers that carry organic products. Simple Solutions for Boosting Size and Yield! Because I used to live in a zone 5 climate (now I’m in zone 4), I use black plastic to warm up my tomato and pepper beds in the spring. I keep a couple of sheets of 4-mm-thick black plastic in the Tool Shed (aka my car). After amending the soil, I anchor the plastic with bricks, or whatever else is lying around, on top of the beds where I’ll transplant my heat-loving plants and let it sit there for a couple of weeks. We all know black absorbs the sun, so it helps to accelerate the sun’s warming effects AND smothers pesky weed seeds before they have much of a chance to take off. 4 mil black plastic is incredibly versatile! I know 4 mil black plastic has a variety of other uses as well, such as makeshift rain poncho, wood chip carrier, ground cover for a picnic blanket, and most recently–a shower curtain! I was 3 days at my new place in freezing cold Wisconsin and hadn’t yet ventured out to find a Target to stock up on the typical new home stuff: wastebaskets, shower caddy, shower curtain, you know, the usual stuff. I was dying for a shower but didn’t want water to spray all over, never even considered a bath (I’m just not much of a bath person) … what to do, what to do. Then it dawned on me that I still had some black plastic folded up neatly in the hatchback of my car! I draped it over the shower curtain rod and clipped it in place with a couple of binder clips at either end, rinsed last year’s dirt off of it, and it worked just fine! Best shower I’d had in a long time, as a matter of fact. Rich Schefren, one of my small-business coaches, liked to remind us that entrepreneurs who were resourceful were often more successful than those who just looked for resources. I doubt he had 4 mil black plastic in mind when he said that. Home Vegetable Gardening by F.F. Rockwell (original copyright 1911) is a rare gem that looks at how people in the U.S. gardened – and lived – about 100 years ago. It is priceless Americana that shows how far we have come socially (note the sentence in the excerpt below about women and smoking) and environmentally (the poisons that were commonly used back then make me shudder – most of them are banned for use as pesticides and herbicides in the U.S. today, thank God) at the same time how some things remain the same. (The author writes in the preface about how having a backyard garden is a great antidote to “high prices” – at a time when a loaf of bread cost about a nickel. There are more reasons today than ever before why the owner of a small place should have his, or her, own vegetable garden. The days of home weaving, home cheese-making, home meat-packing, are gone. With a thousand and one other things that used to be made or done at home, they have left the fireside and followed the factory chimney. These things could be turned over to machinery. The growing of vegetables cannot be so disposed of. Garden tools have been improved, but they are still the same old one-man affairs—doing one thing, one row at a time. Labor is still the big factor—and that, taken in combination with the cost of transporting and handling such perishable stuff as garden produce, explains why the home gardener can grow his own vegetables at less expense than he can buy them. That is a good fact to remember. consulting the columns of the household ledger. The big thing, the salient feature of home gardening is not that we may get our vegetables ten per cent cheaper, but that we can have them one hundred per cent better. Even the longkeeping sorts, like squash, potatoes and onions, are very perceptibly more delicious right from the home garden, fresh from the vines or the ground; but when it comes to peas, and corn, and lettuce—well, there is absolutely nothing to compare with the home garden ones, gathered fresh, in the early slanting sunlight, still gemmed with dew, still crisp and tender and juicy, ready to carry every atom of savory quality, without loss, to the dining table. Stale, flat and unprofitable indeed, after these have once been tasted, seem the limp, travelweary, dusty things that are jounced around to us in the butcher’s cart and the grocery wagon. It is not in price alone that home gardening pays. There is another point: the market gardener has to grow the things that give the biggest yield. He has to sacrifice quality to quantity. You do not. One cannot buy Golden Bantam corn, or Mignonette lettuce, or Gradus peas in most markets. They are top quality, but they do not fill the market crate enough times to the row to pay the commercial grower. If you cannot afford to keep a professional gardener there is only one way to have the best vegetables—grow your own! reason why you should garden. It is the cheapest, healthiest, keenest pleasure there is. Give me a sunny garden patch in the golden springtime, when the trees are picking out their new gowns, in all the various self-colored delicate grays and greens—strange how beautiful they are, in the same old unchanging styles, isn’t it?—give me seeds to watch as they find the light, plants to tend as they take hold in the fine, loose, rich soil, and you may have the other sports. And when you have grown tired of their monotony, come back in summer to even the smallest garden, and you will find in it, every day, a new problem to be solved, a new campaign to be carried out, a new victory to win. Better food, better health, better living—all these the home garden offers you in abundance. And the price is only the price of every worthwhile thing—honest, cheerful patient work. your old togs, light your pipe—some kind-hearted humanitarian should devise for women such a kindly and comforting vice as smoking—and let’s go outdoors and look the place over, and pick out the best spot for that garden-patch of yours. You know how you can go out and buy an expensive toy for your cats and they wind up preferring to play with the bag (or box) the toy came in? I’ve created a simple toy my kitties never seem to tire of: catmint mouse. If you have more than one cat (I have two) make sure that each one gets their own to play with; my Riley can get very punky about sharing his. If you don’t have catmint in your garden, no doubt one of your neighbors does. It is prolific here in the Midwest. I keep trying to give it away, but many of my gardening neighbors see how fast and wide it grows and don’t want anything to do with it. Personally I love catmint for those reasons and because it blooms almost all summer. The bonus is that my kitties go ga-ga over it, fresh or dried. Catmint (Nepeta faassenii) and catnip (N. cataria) are in the same mint family. It is a hardy perennial (zones 4-8) that thrives on neglect. Because it tries to take over my perennial bed each year, I cut it back at least once per season. It has a wonderful, almost woodsy, aroma. My cats love this stuff. So get yourself a big bundle of catmint. I usually wait until mid-August, well after its peak blooming season. Dry it. When I had a gas oven with a pilot light on, I’d lay it out on cookie sheets for a couple of days. This year, I hung it outside under the eaves of my back porch. Once it’s dried, I strip the stems of foliage, trying not to crush the flowers or leaves too much, so my cats get the full benefit of doing it themselves. I grab a couple of old cotton socks that no longer have a mate. I found the easiest method for stuffing the socks is to use the ring from wide mouthed quart canning jars. Stretch the sock opening over the ring all way to the heel. It’s really easy to stuff as much of your dried catmint into the sock as you want. Knot the sock just above the stuffing, so now the mouse has a little tail, and let your cat have at it! I suppose the crafty, creative types would like to add eyes, whiskers, ears, and all, but I don’t. What my kitties love is the smell of catmint. They will wrestle with that little stuffed sock, roll on it, bat it around. My cat Maya has played with her sock for as long as 30 minutes at a time. She can’t seem to get enough of it. 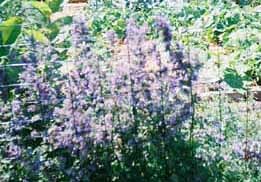 For more information about catmint, check out this article in About.com.